Lis is a lover of improv and silliness. By day she works as the Marketing Director at Alles Law, helping simplify the path to great legal advice. The rest of her life is filled with varying combinations of cats, theater, improv, and over-thinking. She is currently a member of Artificial Intelligence, the improv troupe for the (coming soon!) Comedy Project. 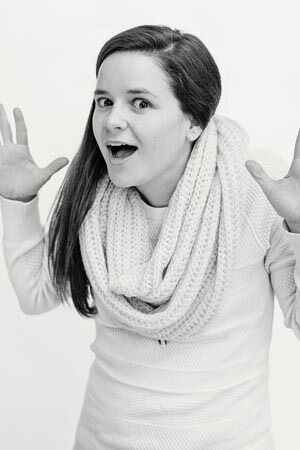 She has also served as the Assistant Director of Civic Theatre’s Rapid Delivery Improv and taught Intro to Improv classes for adults at Civic Theater where she loves re-introducing adults to the magic of play. Her performance background includes improv with RDI, SALT, and Funny Girls, and playing Guildenstern in Heritage Theatre’s Rosencrantz & Guildenstern Are Dead. Lis has studied improv at Second City Chicago, Grand Rapids Civic Theatre, and io Chicago; and acting at Black Box Studio Chicago. Lis’s other favorite things include spreadsheets, singing, her husband, and cats. So many cats. Hearing stories. Whether it’s a movie, play, musical, song, tv show, book, painting, conversation with a friend, etc. I love the way a story can teach you something new about yourself, others, and the world around you. Going back to childhood here I would say Harriet the Spy. She was full of curiosity and adventure!